Name Tags: Right side, aligned with the top exposed button and centered. Unit Crest: Centered on right pocket, 1/8 inch above the star or academic wreath. Marksmanship badge: Left side, centered 1/4 inch below ribbons. No more than 3 total medals/badges (medals go to the wearer’s right of marksmanship awards). Medals/badges must be equally spaced below ribbons. Arcs: Right side, placed between the 2nd and 3rd exposed button and centered. Each pin should be 1/8 inch apart from each other. Star: Right side, ¼ inch above the top of the pocket and centered. 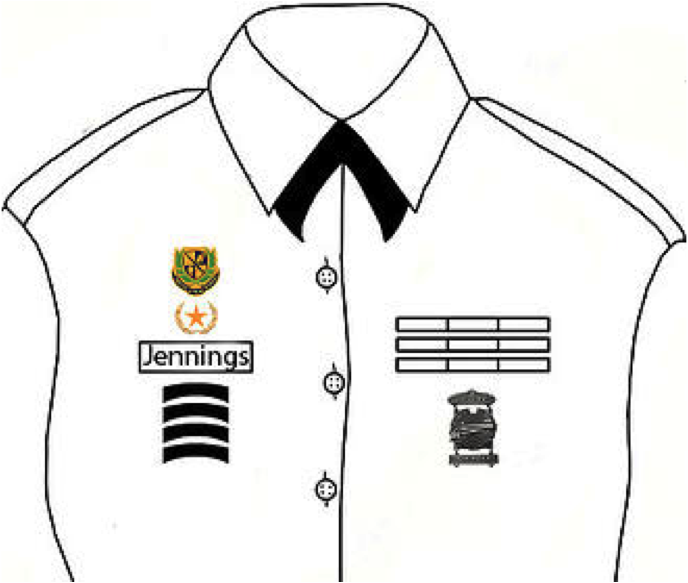 Marksmanship badge: Left side, centered 1/8 inch below top pocket seam. No more than 3 total medals/badges (medals go to the wearer’s right of marksmanship awards). 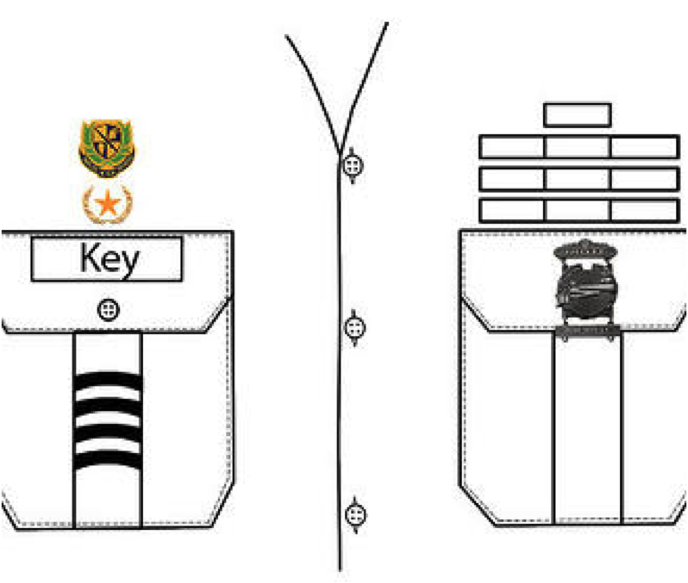 Medals/badges must be equally spaced on pocket. Males: Hair will be a tapered cut, not touching the ears, not touching the collar and not be over approximately 1 inch in length on top. The face will be clean-shaven, except for permitted mustaches. Sideburns will not extend below the center of the ear canal. Males are not authorized to wear braids, cornrows, or dreadlocks (unkempt, twisted, matted, individual parts of hair) while in uniform. Females: Hairstyles are to be natural color and not to interfere with proper wearing of the military headgear and will not fall over the eyebrows or extend below the bottom edge of the collar. Hair is to be pulled back into a bun on the back lower part of the head while in uniform. 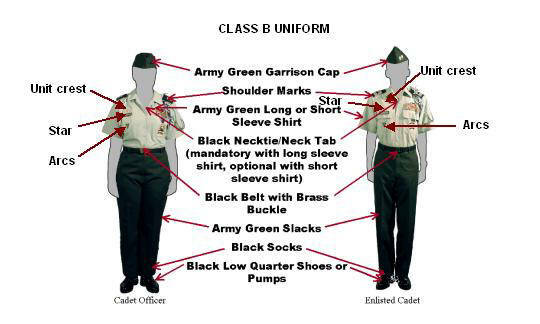 You can only wear a wrist watch, wrist identification bracelet, and not more than 2 rings with your uniform. Female cadets may also wear small circular earrings not bigger than ¼ inch in diameter.